Bunting metal detection equipment is reliable, tough and efficient. 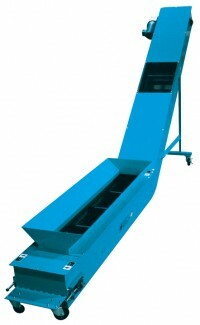 A Bunting Magnetic Conveyor can surgically separate your materials. Our Magnetic Conveyors do a great job at removing tramp metal, cleaning your product and protecting your Shredding and Grinding Equipment from costly knife damage. A Magnetic Conveyor makes your operation more profitable. Bunting has been providing more productive and profitable results with magnetic conveyors, magnets and metal detectors, for over 52 years. A Bunting Magnetic Conveyor meets your demands when moving your products and materials, quickly and efficiently while removing contamination. Bunting Magnetics Company has manufacturing and distribution locations World-wide in England, Australia, and China. In the United States, Bunting Magnetics Company, is located in Chicago, Illinois, Dubois, Pennsylvania, and Newton, Kansas. 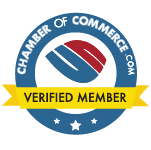 By maintaining warehouse and shipping service in these strategic locations, you can benefit from streamline order handling and speedy distribution. Bunting Magnetics Company has standard magnetic conveyors readily available, or call ACG Conveyors to design and build a custom package that will meet your precise need. Magnetic Cross-Belts do a great job of removing tramp metal, clean your product, and to protect your Shredder and Grinder Equipment from costly knife damage. Our Eddy Current Separators feature an innovative rotor which maximizes Gauss intensity on the belt surface and provides superior separation of non-ferrous materials. Our High-Intensity Separators have extreme high Gauss fields for removal of lightly magnetic tramp metal and separate work hardened 300 series stainless steel. Designed to deliver magnetic position control to transfer empty or full cans into or out of a steamer, filling stations or labeling machines. Available in economical Ceramic or Neo Rare Earth. Magnetic Pulleys offer superior removal of ferrous contamination like nails, spikes, nuts, bolts, cans, and wire for conveyors in the paper, wood, plastic, steel and municipal recycling industries with maintenance free operation. 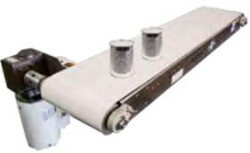 Magnetic Chip Conveyor, Style B has a lower horizontal infeed section with an inclined discharge to any height. 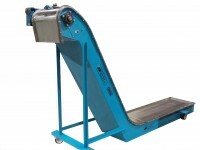 Incline sections come in 30°, 45°, 60°, 75° & 90° increments and widths of 12”, 15”, 18”, 24”, 30” and 36”. Magnetic Scrap Conveyors come in 10”, 12”, 15” and 18” widths and are well suited for machining, milling, stamping, slitting and forming operations. They are inclined conveyor for moving parts or scrap to a dumpster. 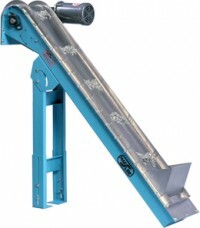 We have many more Magnetic Conveyor styles available. 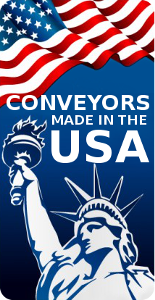 Call ACG Conveyors at (866)403-5232 and speak to a Magnetic Conveyor Expert for more details or complete the Product Request form below.